s you have noticed, Veeam is announcing Veeam Backup & Replication v7 features one at a time at the go.veeam.com/v7 page. We already announced support for vCloud Director, a vCenter Web Client Plugin and the Veeam Explorer for Sharepoint. 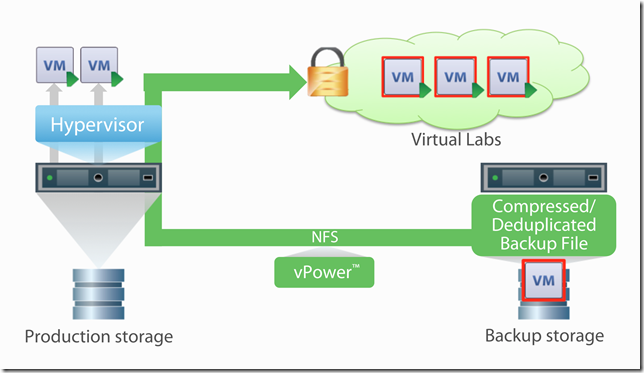 Today it is my honor to tell you that Veeam is bringing all the features of Veeam Virtual Labs to Hyper-V. I will explain all major features in just a minute but first I need to explain where all these features are based on. You get it? Where the lock stands, we put a network proxy appliance. This way you can start as many VM’s as necessary in a protected “bubble”. A classic example here would be an Exchange environment. What could you do with an Exchange server if there is no Active Directory domain controller (DC) available? So you would start a DC first and then the Exchange server. Get the point here? This “ bubble” is the springboard for 3 major Virtual Lab features: SureBackup / U-AIR / On-demand-Sandbox. I’ll walk you through with some use-cases. If you are a backup administrator or have ever been involved with backup products, you will be familiar with the report you get in the morning with all succeeded or failed backup jobs. But given the fact that the report shows the job has succeeded, you still shiver when someone asks you for an actual restore? I know the feeling. With vPower + Virtual Labs we can power on your VM’s like I already explained and test up into the actual application. You could use any test script in the process that really shows you the application is running and responding as it should. Given the fact that you can start an environment identical to the latest backup, wouldn’t it be nice that you can actually recover items? With U-AIR you can recover any item from any application. The same way we gave you the opportunity to actually test your backups. We even got it easier with a click-through wizard for Active Directory, Microsoft Exchange and Microsoft SQL Server. For Active Directory, for example, you will not only be able to restore a single AD object, we will also check the object before you restore it if nothing has changed that involves that object. If, for example, the name of the overlying OU (Organizational Unit) or even a parameter of the object itself has changed, you will get a notification. I can check my last backup if all the applications are recoverable. I can even recover any object from any application without restoring the entire VM and equally important: without any agents within the VM. What more can I do with an environment that is protected from my production network but looks identical to my production network? How about testing a software update or a patch. How many times have we had issues with patches that go wrong? Test it before you run it in production. The alternative is waiting too long with the patches because you want to mitigate the risks. Think about critical multi-tiered applications: developing new versions of your application requires multiple levels of testing: Unit testing / Integration Testing / User Acceptance testing / Production verification. Wouldn’t you rather do all of this testing on an actual production environment? Wouldn’t it sometimes not shorten the actual testing process? With On-Demand Sandbox you can do just that. A third option that comes to mind is training. How many of you had new colleagues on the IT staff that need to learn in a production environment? It’s called hands-on learning, right? I know I learned a lot this way, but I also know I screwed up a few times because I had not actually done the process before. What if I could have just done the wizard on yesterday’s production environment first? All these powerful features are coming soon to Hyper-V in v7 (2013/Q3)! You can review one of our WhiteBoard Friday sessions.